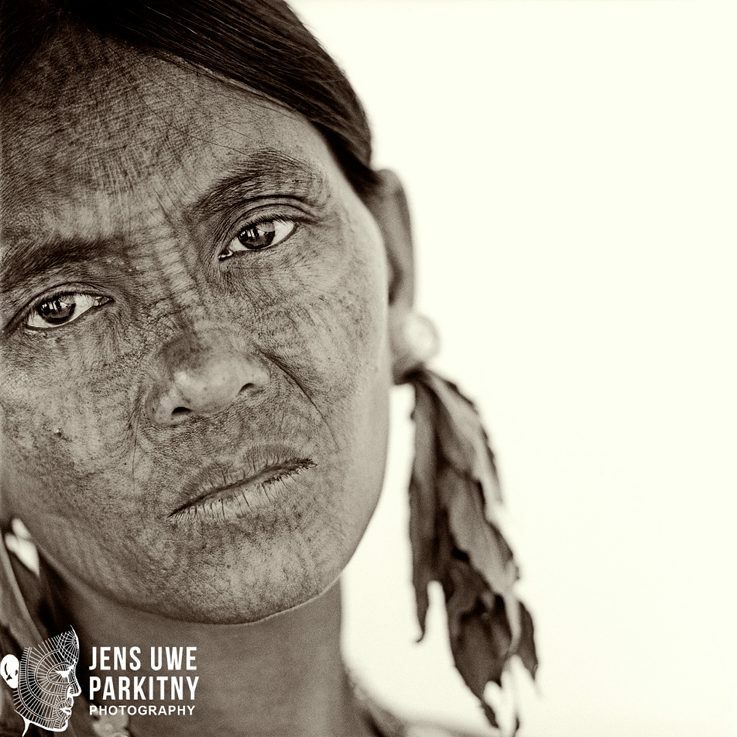 Jens Uwe Parkitny captures the aesthetics of the Chin-women’s facial tattoos by moving beyond the pure documentary photography, using a neutral background and close-ups. 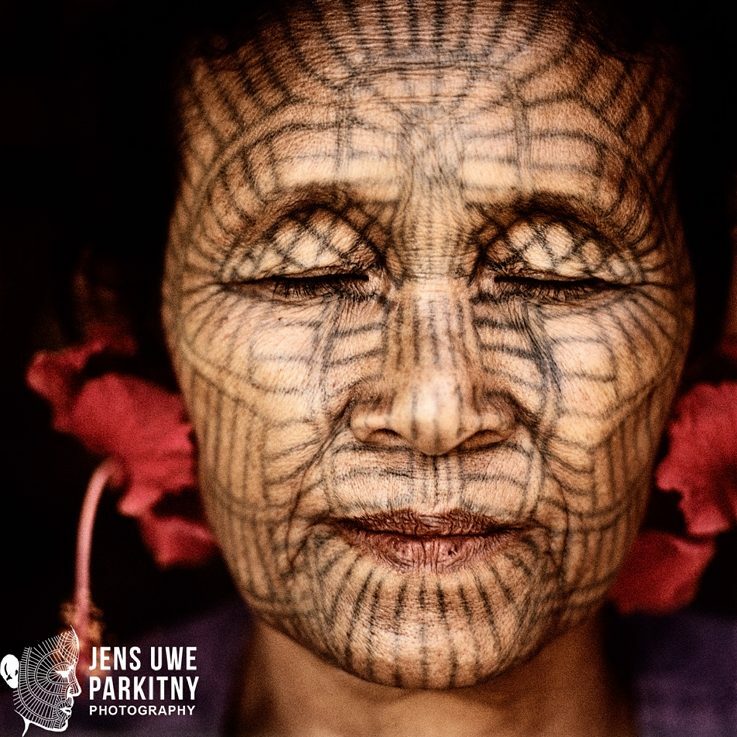 Each tattoo is a unique artwork, and is adapted to the individual’s face, complementing its lines and shapes. The popular tale of the origin of the Chin facial tattoos says that the practice emerged as a pre-emptive measure to prevent the abduction of Chin women by the Bama kings. 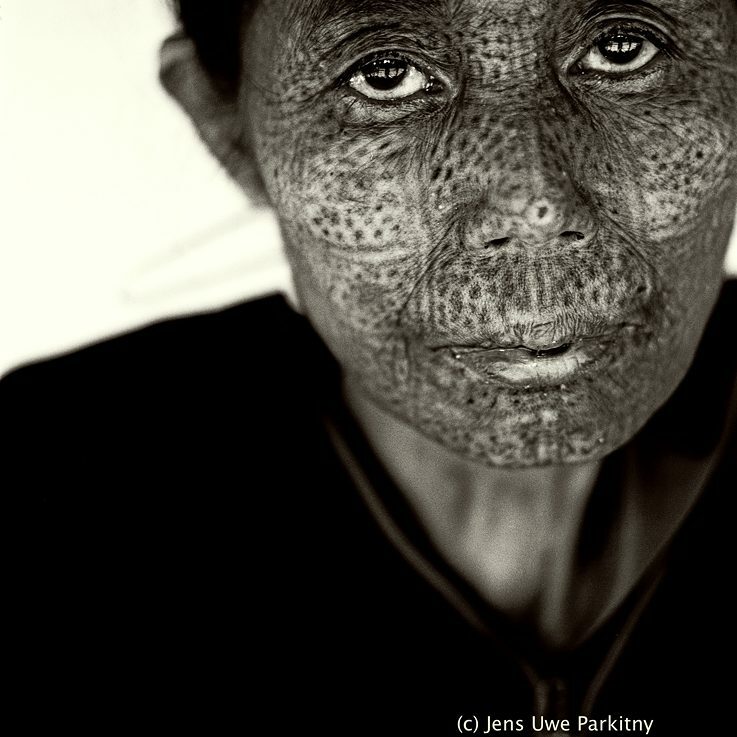 With rattan thorns or mountain lemon prickles symbols and patterns were tapped into the dermal tissues of the face to destroy their beautiful appearances. There is, however, a lack of historical evidence to support this myth, and it is far more likely that they serve an entirely different purpose. 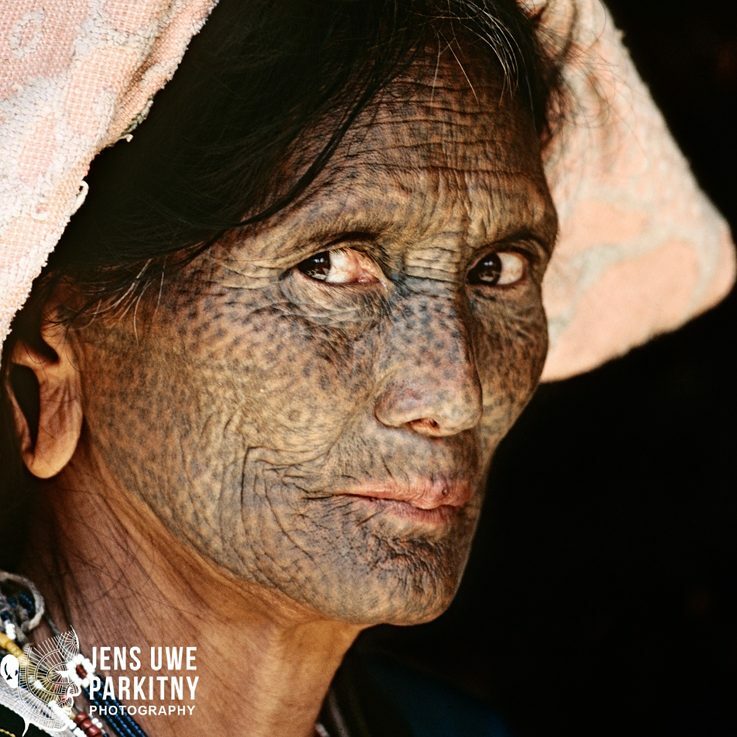 Indeed when asked about the specific meaning of their tattoos, the Chin women usually answer “because it makes us beautiful”. The exact knowledge of the origin of the tradition appears not to be a knowledge which has been preserved among the Chin. However, it can be assumed that the practice is older than a few hundred, maybe even a thousand years. 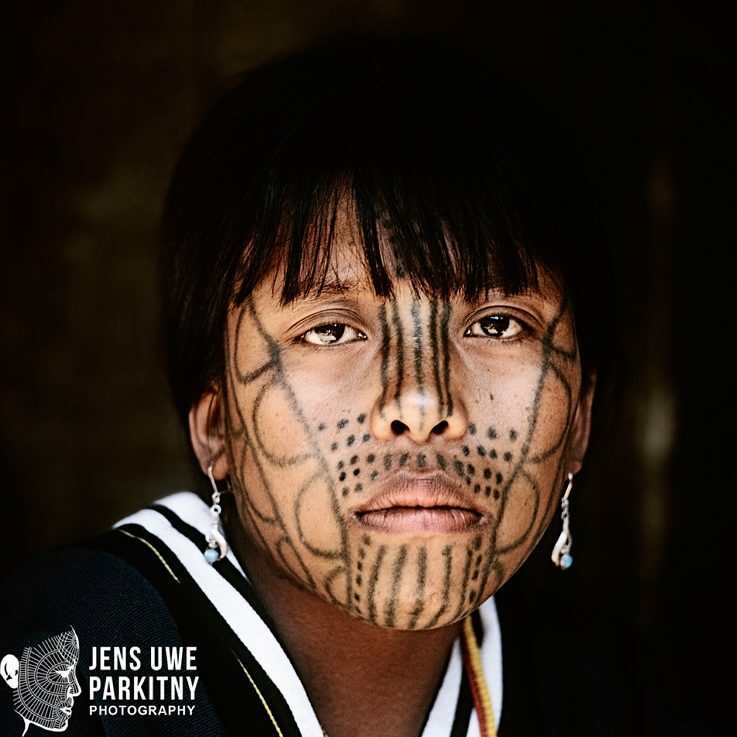 Scientific interpretations of the symbols and patterns have been successful only to a limited extent, and lack a holistic approach to the connection between the material culture and tattoos of the Chin women. 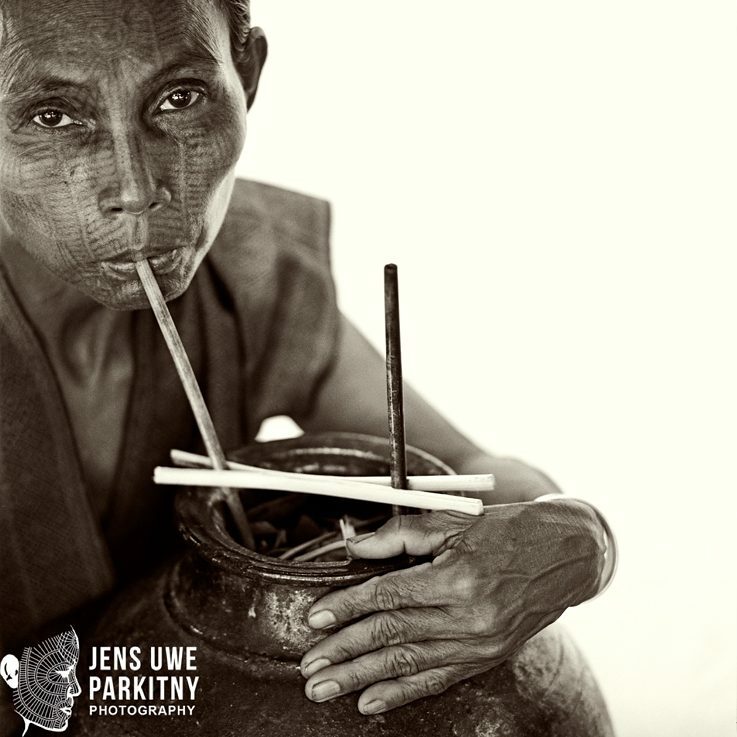 This far, only individual aspects have been studied, detached from each other, resulting in an incomplete image of this ethnic group and their culture. 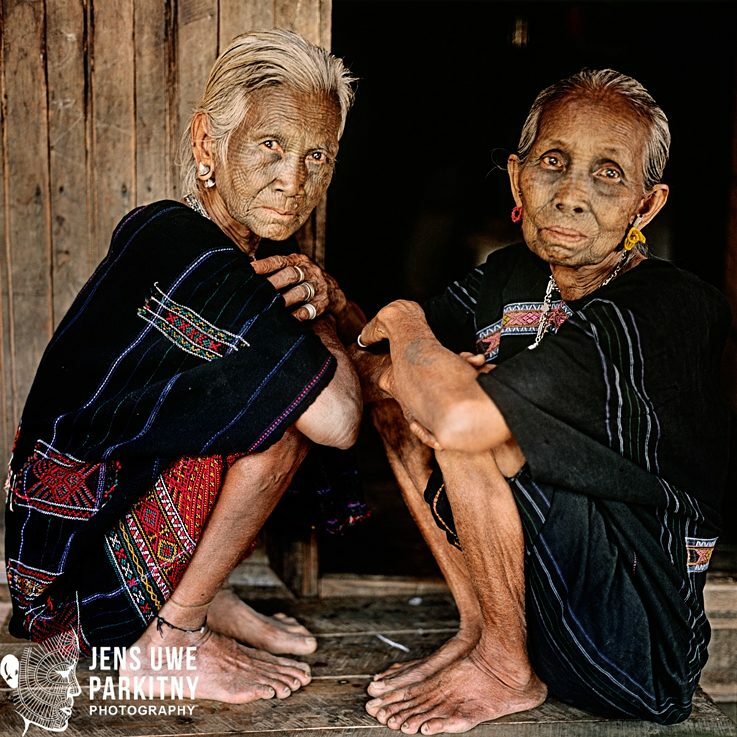 The Chin in Myanmar are not a homogeneous group, but consist of at least 53 different tribes which speak 44 languages and dialects, in addition to demonstrating a variety of cultural marks. Only about a dozen of these groups have handed down the tradition of tattooing the faces of girls and young women. 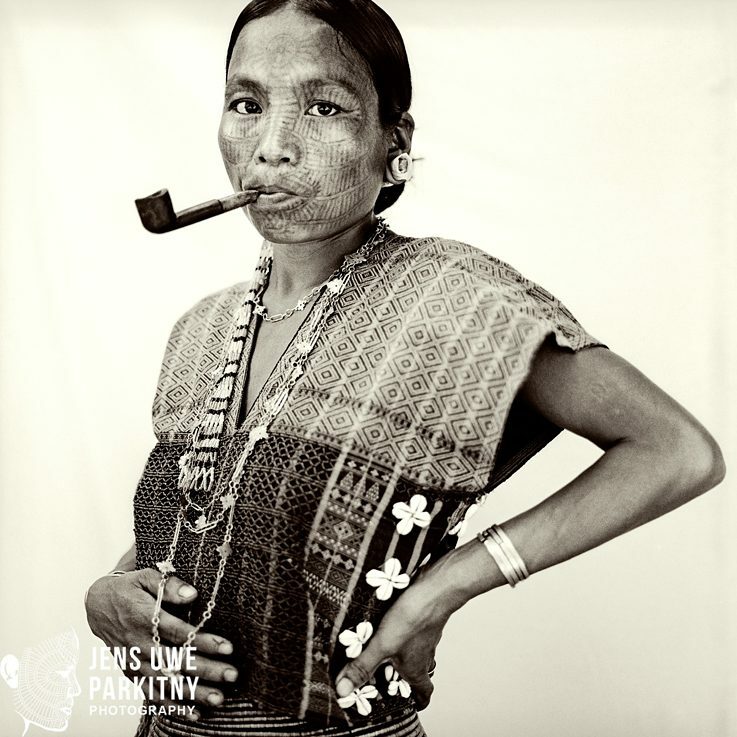 Self-woven tunics with sophisticated, color-coordinated patterns as well as silver necklaces, finger rings and earplugs are being complemented with complex tattoo patterns, for example among the Laytu Chin women, creating a striking and captivating appearance. A connection can be found between the symbolism used in the respective material cultures, such as woven works and the tattooed patterns. The tattooing ritual is also an important rite-of-passage, marking the transition between girlhood and womanhood. The procedure is usually performed on girls between 7 and 15 years old. Forehead and cheeks are tattooed first, followed by the part around the mouth. The eyelids are done last and require great delicacy and craftsmanship. These “Marks for Life” are a visual expression of group belonging and identity, of the ability to endure pain, of having mastered different stages in life, of community membership and status and of a particular perception of beauty. Beyond this they have a spiritual function, providing protection in life and beyond. As part of their program of modernization, the socialist government banned the practice in the 60s, deeming the practice as cruel and pre-modern, a sentiment echoed by Christian missionaries. While an inalienable human right to physical integrity might be an argument in its favor, the ban involves a certain degree of arrogance on the part of Myanmar’s politically dominant ethnic majority vis-à-vis the country’s “primitive” minorities. 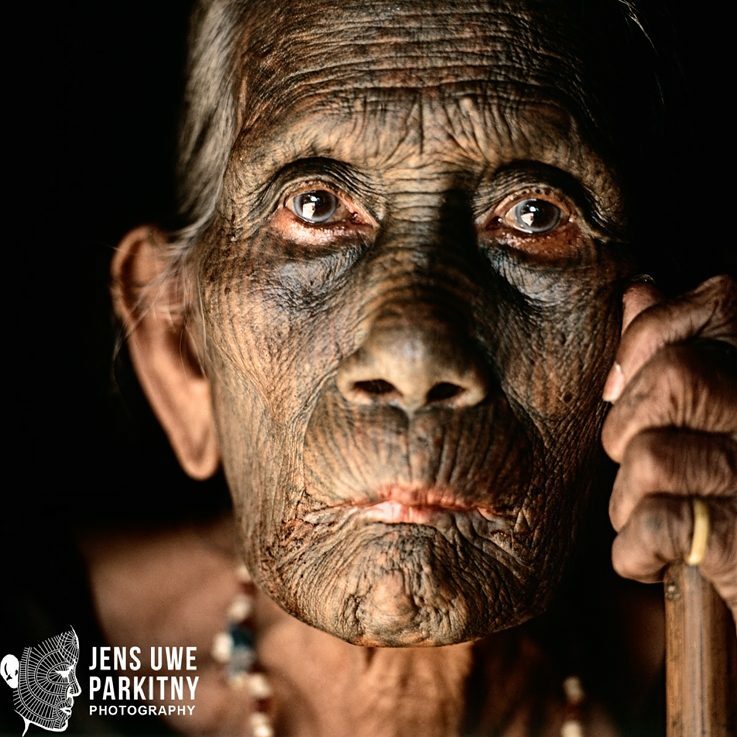 Today the practice is in danger of dying out with its bearers, making Parkitny’s portraits and detailed illustrations of the tattoo-patterns a valuable documentation, preserving it for future generations in his volume “Marked For Life”, published in 2017. 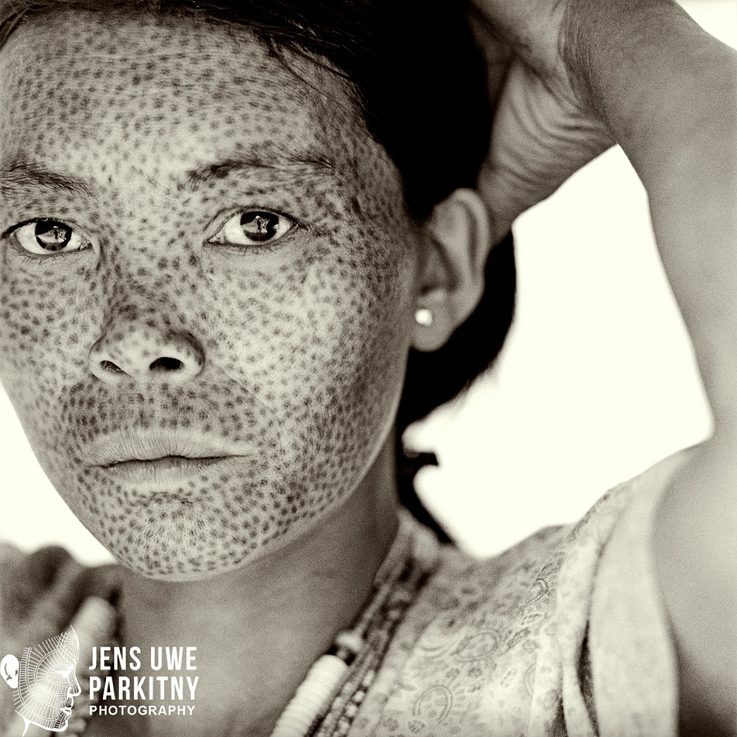 Even within Myanmar, the Chin’s practice, its meanings and diversity is not well known, and so a section of the book contains a Burmese translation of the contributions. Although a revival of this tradition may take a while to occur, consciousness around the importance of cultural diversity is building within Myanmar. Chin women as well, are becoming more confident and proud of their cultural roots and ancestry.